Every child has different interests in books he or she wants to read. Just look at the variety that were taken home in backpacks tonight! Wow! Look at all those great books. It must have been an exciting weekend of reading. I teach Grade One in Ontario, Canada. Is there a book you would recommend to my class? Happy Reading Grade 1 and 2’s! I can see some Elephant and Piggie books in the crowd. My multiage grade 1/2/3 class loves those too! Happy reading! 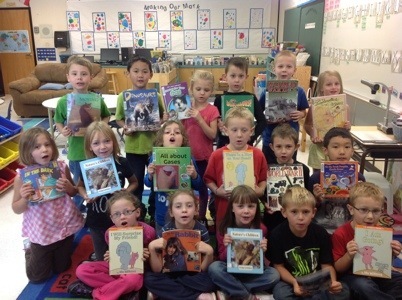 You all look so excited with your books! We could see that a lot of you have non fiction books. They make very interesting reading. Congratulations on being so keen to improve your reading skills. From Mrs. K and Room 4 at Craigburn Primary School.